1947 Rock Tavern Retreat is back in our family and part of the Massanutten Springs tradition! We're delighted to add the 1947 Rock Tavern Retreat, with deeded Shenandoah River access, to the Massanutten Springs family of vacation properties and look forward to sharing its awesome history with our guests! Abe Kibler and his wife, "Aunt Lizzie," owned, built and tended bar in the historic stone tavern, and in bygone years, created their own Rock Tavern tradition of hospitality. In past years, guests competed in shooting matches, where winners took home salt-cured hams or turkeys, or purchased any of the unique items offered for sale: hand-made marbles, a mink fur pelt brought in by an area trader, or an arrow head. Today, guests of the 1947 Rock Tavern Retreat experience that same tradition, preserved in its walls: the initials "ATK" and "1947" (the year that the original Rock Tavern was built) are carved into the original, richly colored, hand-laid, natural Massanutten Mountain stone that features in the Retreat's interior decor. Framed articles and other decorative touches that evoke Rock Tavern's early history in Page County, Virginia add to the Retreat's "Tavern" atmosphere, as a Page County landmark-turned-vacation cabin-retreat returns to our family (and yours!) once again. 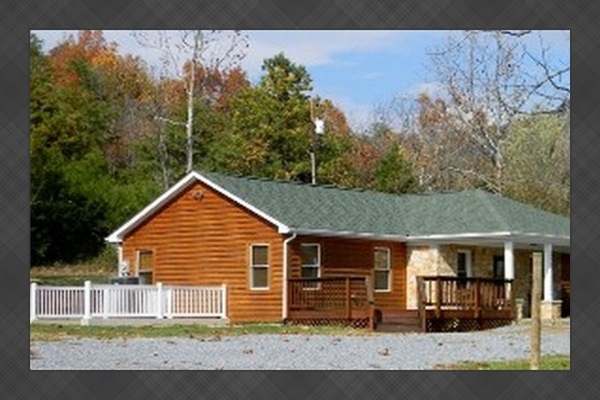 Couples, families, and travel companions delight in the privacy, spaciousness, and relaxing Shenandoah River vacation experience offered by the 1947 Rock Tavern Retreat rental cabin. Gather in the bright, sunny living room and really stretch-out -- in theatre-style leather recliners, where all can enjoy the 60" TV with home-theatre sound. The wrap-around private deck offers more space for fun with outdoor cooking opportunities on a charcoal grill and stainless steel gas grill. An outdoor firepit and picnic table invite friends and family to get together outside, share stories, and enjoy the beautiful views of the Blue Ridge, Massanutten Mountain and the Shenandoah River that define a truly unique, Within walking distance to our #1 Rock Tavern River Kamp which is your access to waterfront - on the Shenandoah River for fishing, swimming, canoeing, kayaking and tubing. And WHO can resist a dip in the heated, 6-person (incl. lounger) Laguna Bay Spa with LED colored lights, and adjustable waterfall? -- or a relaxing soak in the master bathroom jacuzzi tub? Within 7 minutes to Luray Caverns (open year round) 20 min to Shenandoah National Park (Skyline Drive), 7 miles to George Washington National Forest...lots of hiking trails... Hike the Kennedy Peak Trail!